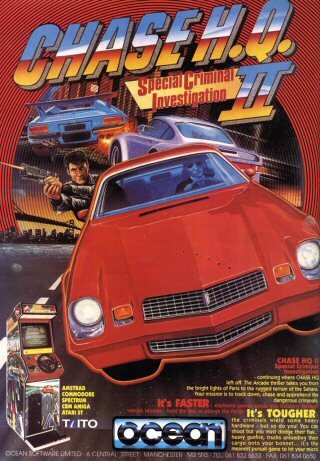 Undoubtedly the race game of 1990. Superb! The heat is on! The steaming roads beckon your turbo-charged Porsche 928 as the screeching tyres in the distance heralds another crime being committed. "This is Nancy at Chase HQ" - we gotta few perps to catch, Algernon, Looks like you ain't gonna get much sleep tonight" "Gotcha, Nancy baby! We're on our way!" Details of the perpetrators vehicles flash across your in-car computer screen as you tear away down the busy L.A. streets in search of your quarry. You are the head of SCI (Special Criminal Investigation) and the type of guys you chase don't stop for no-one! After years of experience, you have discovered that the only way of stopping these people is to ram 'em off the road! Your limited Turbo Chargers help you catch up, but these guys seem to drive the best (and fastest) sports cars on the road, so catchin' em ain't easy.